Before you non-job-seekers cut out me, this post very accurately could have been titled 8 Great Tips to Prove Your Value to Your Employer. So, stay tuned. Let’s be honest. How many times do we need to remind our own employers of our awesomeness? I don’t know about you, but I seem to need to remind my guy every day because he can’t remember a thing. Although recruiters are a funky bunch and review those resumes quickly, they do notice an impact player when they see one. So, how do we get you to SHOW you’re that impact player? 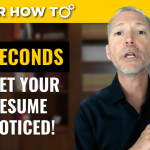 I’m really confident I can improve your resume if you follow this video and spend a few moments considering these tips. Want to know how confident? 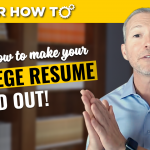 I will give you my Build Your Ultimate Professional Resume Course & Workshop plus any additional online training course you find on the milewalk Academy site—FOR FREE—if you can stump me. Details later. C’mon buddy. Where are my 8 Tips? Improve market and brand awareness. Hey marketing-type folks! Are you creating a better-known brand? Measure it any way you can. Is your company getting more inquiries or email addresses? Is your website traffic increasing due to content marketing? Google Analytics anyone? Customer attraction and leads. Inside sellers or anyone on the front end of sales can be opening doors. You might not be closing the deal for your company, but you’re filling your sales pipeline. Any lead generation works. Managing a booth at an industry fair? Are you collecting business cards or starting a customer or partnership relationship? Customer happiness. Service people can rejoice! Maybe you’re a call center operator and helping people who call in because your product or service is broken. You fix it. Voila! What are your customer satisfaction scores? What is your customer retention rate? What about renewals and renewal rate? Corporate growth and security. Let’s not forget the executives. Have you done anything related to supporting an Initial Public Offering, acquisition, divestiture, etc. Is your corporate and online security safer? Employee happiness. Human resources, recruiters, and all who manage employees can focus on happiness. What are those employee satisfaction scores? Are your employees staying? Is your attrition bad or is your tenure really, really great? Are your recruitment numbers good? Are they healthy? Are your people progressing through their careers and going through the ranks and staying with you because you offer such great opportunities? Cost reduction. Yeah baby!! Let’s save some money! Did you do anything to save your company money? That could be anything. It could be optimizing a system that makes you run more efficiently. It could be reducing expenses. Processes you do faster save money. Process efficiency. Optimize anything lately? I mean anything?!? Did you optimize a process that lets the rest of the employees do their job easier or faster? Maybe you’re an accountant who figured out a way to reduce your company’s month-end closing cycle from fifteen days to seven days. That saves money. It probably reduces mistakes too. All of that stuff is gold on a resume. Are you a hostess? How many people do you care for and seat and service each night? Over the course of the year? Are you a mail carrier? How many houses do you deliver the mail to? How many pounds of mail? How many square miles do you cover every single day, year in and year out? Are you a mechanic? How many cars have you fixed within the last year? Are you a project manager? What’s the size of the project budget? Did you complete it on time? How many people did you manage? How many people did you coach? How many people did you mentor? We could go all day, but I have a time limit and word count limit and your attention span limit. I’ll respond with advice. If I can’t figure out something for you to add, you can have my resume course & workshop for FREE and any other online training course in the milewalk Academy. Tell me I don’t love you. Want more resume help? 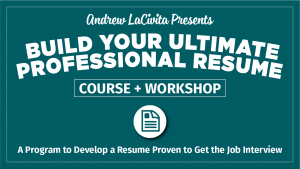 For a ridiculously low investment and huge value, check out my resume course & workshop! Have you seen my FREE Job Interviewing Webinar titled 3 Keys to Ace Any Job Interview? There are several available times this week. Attendees receive an awesome eBook titled Ace Any Job Interview. Check it out! I hope all is well. Thanks for your webcats, I find it very interesting. I am working as Risk Management Engineer in the construction field. I really have a hard time to quantify and show impact. The main problem is I kinda established the risk management department in the company. So, the challenege here is to articulate the activites and what the value is. It would be greatly appreciated if you can provide some advice in this regards. Mohamad, thanks for watching and attending the webcasts too. It’s difficult to be specific without knowing your particular tasks, but one place I’d head is to this vlog post: http://milewalk.com/mwblog/best-way-get-promoted-quickly/. While it looks like it’s a promotion suggestion, there’s actually a career achievements journal FREE download in the post and it will help you with questions that will spawn ideas regarding how to quantify your benefits or highlight the benefits! You have been a blessing to me your advice have been awesome. I am a Professional dog groomer. I am currently lead groomer having 10 years experience. I am also a current college student pursuing a nursing career (second year) but no degree or certifications yet. However I would like to transition into working in a hospital setting. Maybe clerical or something similar basically just to get my foot in the door for possible promotion upon graduation. and I can’t figure out how to quantify or show impact. What should I do? Shay, we’ll cover this in the course I just gave you! Will, great question. Think in terms of how many “things” you made on the assembly line. You can quantity in terms of products made, products reviewed, parts made, etc. You can quantify by day, month, quarter, year, etc. Think about what you did on the assembly line and speak to “how many” or how much improved. On the forklift, how many pallets (or whatever it was) were being moved and managed each day? In the shipping/receiving department, how many packages (on average) did you receive and handle or route each day? Those types of questions should get you moving in the right direction! I have worked most of my life as an assistant/secretary.. I’m unsure of how to show quantity and impact on my resume. I found your videos on YouTube yesterday and signed up for your blog posts. I also enjoy your videos. My husband and I moved from Albany, NY to Arizona two years ago when he was laid off from his IT position (his department was outsourced overseas). He’s employed now, but will be retiring next year, and we will be moving to another city. I’m am 60, and trying to transfer my administrative (non-management, non-sales) skills to those necessary for animal health and/or training. I am a veterinary assistant of 2 years experience from both education and work experience. I was terminated after 6 months in a very low-key veterinary hospital. I haven’t been able to land another job since April. I have applied for every job out there in the veterinary field and have had at least 10 interviews with no luck of a second interview let alone getting hired. Is there any advice you can give me to improve my resume, cover letter or interviewing process to help me land a job?? I am a single mom of three boys and we are struggling financially. Hi there! This is great! You don’t necessary ned to speak about revenue specifically (you can, of course), but I might start with…. 1) How many people have you tutored (daily, weekly, monthly, annually, in your entire career)? i bet it’s a lot! 3) you could identify what the average cost is for each student and multiply that by the number you teach annually to show how much revenue you’ve helped gain. Thank you for the great tips on improving my resume. Going from “what I am seeking” to “what I offer” was all the difference… Thank You! Gm Andrew. I owner a painting business for a while and now am back Working as a employee. In building a Resume i’m not sure how to word the resume and build an impact and quality so that The employer will take a look at my resume first. 2) how many different terrains, etc. The easiest way is to start quantifying the activities you’ve performed/investigated, and then look for ways to see what was done with the information you’ve surfaced. If you’ve worked with haulage, how much was hauled, how much does your company received from what was hauled, etc. How we you involved in that process. Thank you so much, I’m hearing you every morning (by spotify). I’m Information Security Analyst in a big company and I’m here since 2015. I’ve got great acomplishments at this company and at the previously jobs, whereas I’ve done two big projects, I’ve led two service providers and now I’m leading an internal team in Security Operation. I’ve set new challenges for my career, I’m looking forward move out of Brazil and I have been applying for openings abroad, but I got few interviews in 4 months and I didn’t get a international position yet. I’m confident with my acomplishments and the goals I had achieved during my 5 years experience, I would have your feddback to boost my CV and accelerate my objectives. Thank you to be helping. Silvio! Thanks for your comment. There are many things that contribute to getting the right job interviews–a nice cover letter, resume, LinkedIn profile, and so on. You also need a persistent job search strategy. And, once you land the job interview, you need to nail it. I have free and paid coaching in all these areas and I suggest you check out the milewalkacademy.com to see the videos, webinars, and downloads. One item I want to point you to, is my career achievements journal (https://milewalk.lpages.co/leadbox/1430d183bf72a2:17fd80be1346dc/5731824118530048/). 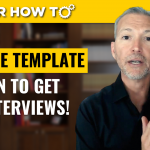 Check that out because if you can capture your accomplishments with that tool and then get them into your resume (and stories as you interview), you will be in great shape!! Hey, Andy, in my last position I was a software developer maintaining an online tax application. The app as a whole certainly saved money for our clients and streamlined their tax processes, but I was just one developer on a team of 8. How would I quantify my individual contributions to the app? Nick, you can actually quantify whatever you think is noteworthy. For example, how many programs/scripts did you write, how many modules did you build/maintain, etc. You can also talk about how much the system saved for your clients and how much it reduced the their time and so forth. The fact that you were one developer is okay. You are giving context for the entire program you contributed to. The main point is you’re giving the reviewer insight into what you built! 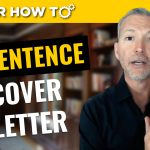 Mike, search the blog for career changer information and also head to my youtube channel and check out the career changer playlist!